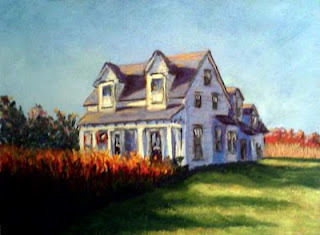 I've painted more than one painting of our farmhouse in New Brunswick, Canada. For example, this one which one of the first paintings I did up in Canada, during the first year that I had taken up pastel, and this one, of the early evening. But I have never done one with fall colors. I was at the farm this past October to see some fall colors, and took quiet a few photos as well, so decided last night I just had to do a painting, and I'm pretty happy with how this one turned out. It's a subject near and dear to my heart But I think this is my favorite of all my farm paintings so far! It's done on 9x12 Art Spectrum.